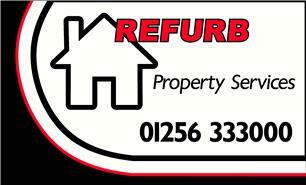 Refurb Property Services - Painter/Decorator, Rubbish/Waste/Clearance based in Rankine Road, Hampshire. Refurb Property Services are specialists in deep cleaning and clearance based in Basingstoke. Areas up to 20 miles are covered with a free no obligation quote and advice. As a cleaning and clearance specialist we have undertaken all manner of clearances since being established in 2009 from small flats to large neglected properties where a complete service has been required. Every clearance is different and the contents vary from property to property, should there be any items suitable for resale we are always happy to offset them against any charges, so many clearances are free of charge. Within properties there can be items that although functional have limited resale value. We work with adult services so all items are donated to worthy causes. We also work in conjunction with home owners and adult services to assist people who are clearing rooms so they can live down stairs, or downsizing moving on to their smaller homes. Basingstoke, Alton, Guildford, Aldershot, Winchester, Southampton, Andover, Newbury, Reading.